Pad Thai is a Thai dish made out of stir fried rice noodles flavoured with fish sauce, tamarind juice, chilli peppers garnished with bean sprouts, shrimps, chopped peanuts, eggs and lime juice. This dish is the national dish of Thailand and is listed at number 5 on CNN’s World’s 50 most delicious foods readers’ poll in 2011. Pad Thai in English means “fried Thai Style” which truly defines its cooking process where noodles, meat and vegetables are stir fried in common Thai spices and herbs like tamarind, chilli, coriander and fish sauce. This dish already existed in the ancient Siam for centuries where a variant of the rice noodle brought over by Vietnamese traders was made into this lovely dish. Though it was existing for centuries it was just recently popularized when it was made the national dish of Thailand by the 1930s Prime Minister Luang Phibunsongkhram. This was in line with the Prime Ministers campaign for Thai nationalism as well as to reduce rice consumption due to the rice shortage available for export during that period. A very uniquely flavoured dish where sweet, sour, spicy and savoury elements mix well and accentuated by hints of peanuts and seafood. A real good noodle dish specially paired with garlic soy chicken or spring rolls, I guess the CNN readers’ poll can attest to it. In a large bowl pour enough boiling water to soak your rice noodles, soak them until it is just soft ready for stir frying. Drain then rinse with cold water then set aside. Combine all Pad Thai Sauce ingredients in a bowl, stir well until you achieve a smooth consistency. Dissolve cornstarch in soy sauce in a separate bowl then add the chicken. Add the chicken then stir fry until cooked. Add the noodles, Pad Thai sauce and prawns, gently toss while cooking for 3 minutes. Place noodles in a serving plate, then garnish with chopped roasted peanuts, spring onions, scrambled eggs and lime wedges. I am soooooo all on this recipe! 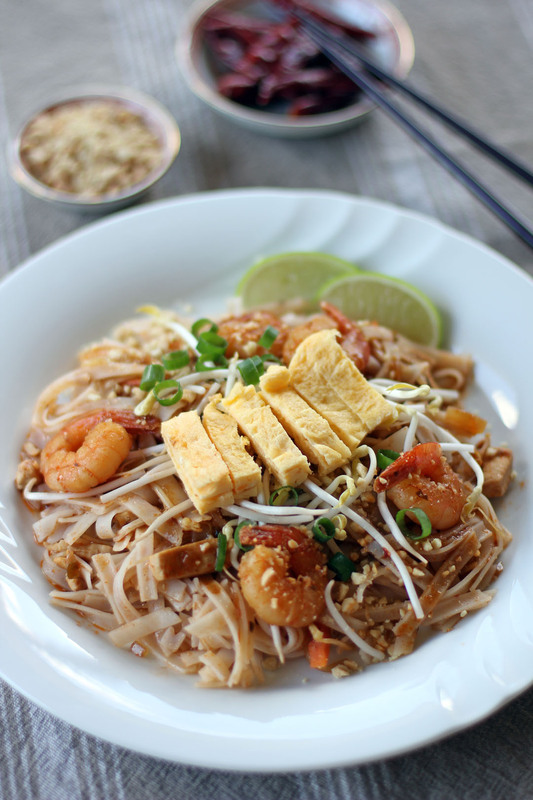 Pad Thai is simply one of the best rice noodle recipes. Yours looks so good! Pad thai can vary so much in taste and texture. When i was in Thailand the traditional Pad Thai which i had tasted was nothing like anything i had in Australia. The authentic pad thai i had, has a much thicker texture with a tomato base. 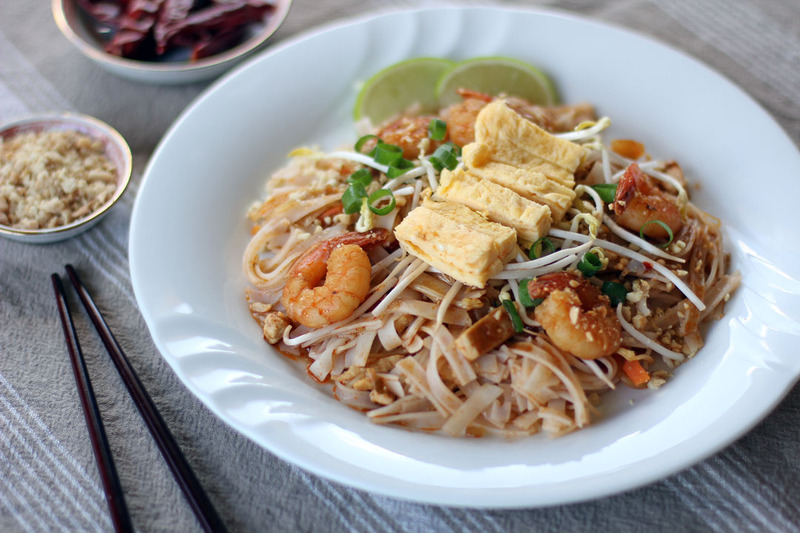 This recipe looks like a delicious and western version of Pad Thai. I will be trying this for sure! Remember to substitute the chicken stock, cornstarch and soy sauce for the gluten free brands. The Pad Thai noodles are essentially rice noodles as well and these should be gluten free, but always check the pack. Happy cooking! where can I get tamarind paste? looks so yummy and always a kid favorite. Looks awesome and your timing couldn’t be better. Katherine just asked for this! I love Pad Thai! And your version looks so good. Thanks for this. I LOVE pinning your pictures to my Asian Food board. You really have great recipe and pictures of food that I truly enjoy! Love pad thai. Lately we’ve been eating Pad See Ew. Kind of miss pad thai now after seeing this post!